With just three required ingredients -- a tortilla, cheese and a little oil -- a quesadilla makes for a simple, inexpensive meal. It’s not necessarily a healthy option, however, given that it's loaded with cheese. By choosing the right ingredients, though, and keeping the portion size reasonable, a quesadilla can be a comforting, nutritious lunch or dinner. 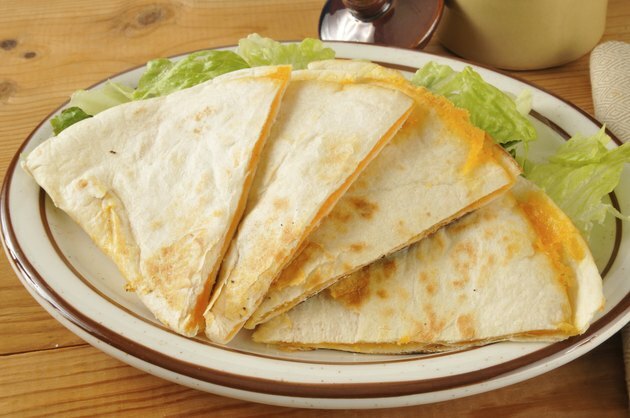 According to a recipe on MarthaStewart.com, a basic quesadilla is made of flour tortillas, Monterey Jack cheese or queso blanco and canola oil for frying. Each 8-inch flour tortilla -- the recipe calls for two -- contains 146 calories and 3.7 grams of fat, while 1 tablespoon of canola oil has 124 calories and 14 grams of fat. Monterey Jack cheese contains 211 calories and 17 grams of fat per 1/2 cup, while queso blanco contains slightly less, at 183 calories and 14 grams of fat. Overall, this means one traditional quesadilla made with Monterey Jack cheese contains 627 calories and 38.4 grams of fat, while the same dish made with queso blanco contains 599 calories and 35.4 grams of fat. Calcium and sodium both appear in abundance in a quesadilla. Each flour tortilla has 80 milligrams of calcium, while Monterey Jack cheese contains 421 milligrams and queso blanco contains 407 milligrams per 1/2 cup. Adults should aim for 1,000 milligrams of calcium a day to promote strong bones and teeth, so a quesadilla can give you up to 50 percent of your daily needs. On the other hand, you want limit sodium. Each 8-inch tortilla contains 364 milligrams, while Monterey Jack cheese has 339 milligrams, and queso blanco contains 415 milligrams per 1/2 cup. You should limit your consumption of sodium to 2,300 milligrams a day. By making a quesadilla at home, you have more control over the ingredients and portion size. You can significantly cut calories by using just one flour tortilla instead of two, folding the tortilla in half to create a half-moon shape. You should also measure out the amount of oil you use when frying the quesadilla, says the cooking and food website The Kitchn -- the dish easily gets soggy instead of crispy in the pan. To cut calories and fat even further, use reduced-fat cheese in the filling and sprinkle the cheese on the tortilla lightly. Although sour cream is a traditional accompaniment to a quesadilla, it adds 46 calories and nearly 5 grams of fat per 2-tablespoon serving. Instead, use 2 tablespoons of salsa, providing just 10 calories and 0.6 gram of fat. By using a whole-wheat tortilla, you'll get around the same number of calories and fat but also consume nearly 5 grams of fiber. Although a cheese quesadilla, by its very name, contains only cheese, adding vegetables such as spinach, peppers, onions, mushroom or zucchini will increase the quesadilla's vitamin and mineral content. To add protein, include beans, chicken or shrimp in the filling as well, though these additions will increase the calorie count of the dish.